I completed stitching The Sampler Girl “Christmas Bells” mini-pillow before starting on “Gingerbread Cookie,” but right now it’s just sitting in my flat pile because I haven’t yet decided how I want to finish it. Or, as I like to say, it needs more thinking about. 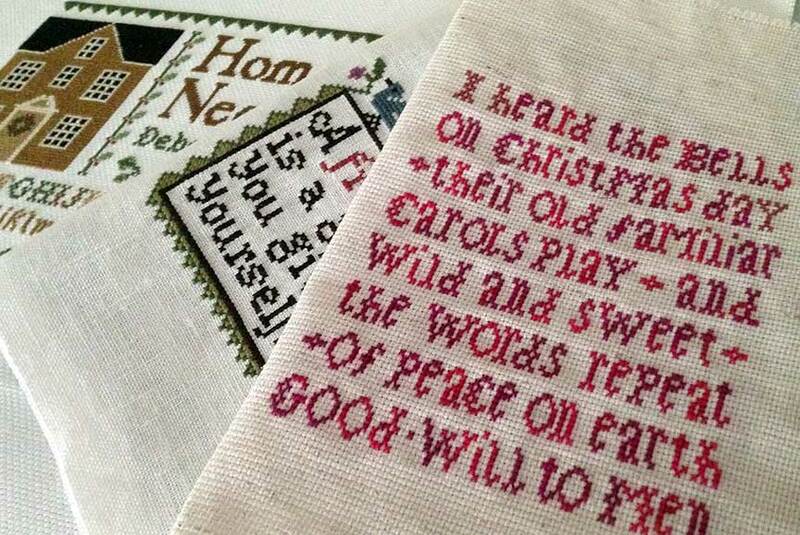 Some of my projects take a lot of thinking about before they get “done.” For example, the completed sampler on the bottom of the pile in this photo has been sitting around since 2009. Good grief! I’d wanted to get it professionally framed, but there’s no money in the kitty for that, so instead I decided I should just deconstruct an old frame to create a new one. Somehow I’ve just never quite gotten around to doing that. Hey, it’s only been six years. Funny how long it seems to take me to get around to things these days.